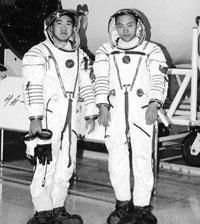 Two astronauts photographed at time of Shenzhou 4 launch. 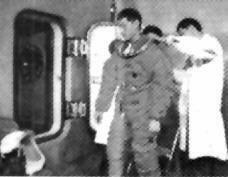 The Shenzhou flight suits were reverse-engineered from the Russia Sokol suit. The suits are designed to protect the astronaut in the event of cabin depressurization, and not for use in extra-vehicular activity. Gross mass: 15 kg (32 lb). 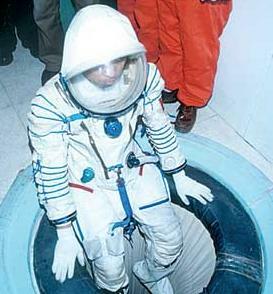 In April, 1992 the Russian Zvezda institute sold to China a single Sokol space suit for $50,000 cash. This single example was torn down, reverse engineered, and became the suit for the Chinese Shenzhou program. The suits cost $15,000 apiece to produce in China. There is no regulation of temperature and pressure, and no environmental control system. The helmet is integral to the one-piece suit. 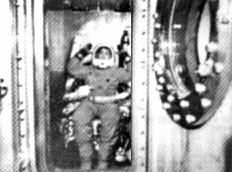 In case of depressurization of the spacecraft, external emergency tanks supply oxygen at a rate of 21 liters per minute. Suit pressure is kept at 39kpa for three hours, and then 28kpa for three hours. 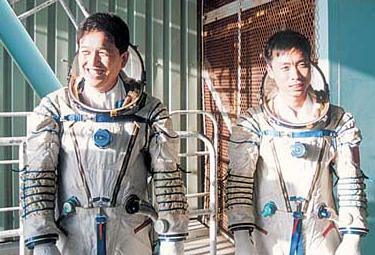 The suit was worn for the entire one-day mission on Shenzhou 5, the first Chinese manned spaceflight. For Shenzhou 6, the crew removed the suits and donned blue coveralls after entering orbit. Family: Space Suits. Country: China. Bibliography: 424. 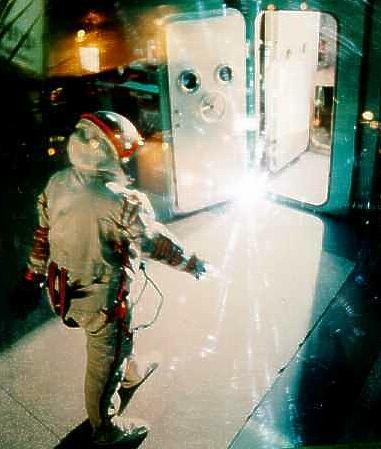 Colour, uncensored version of photograph of backup astronaut for Shenzhou 5 mission. 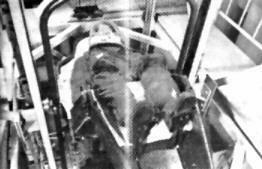 This photograph shows the design is clearly based on the Russian Sokol suit. 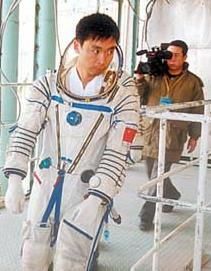 Chinese astronaut enters pressure chamber to test new-design pressure suit, 1998. 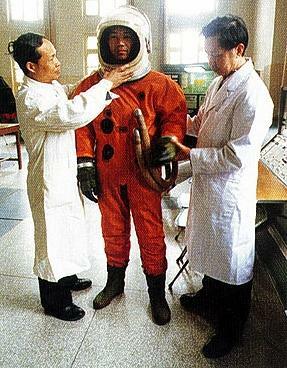 Chinese astronaut in spacesuit being prepared for test in altitude chamber, 1980. Chinese astronaut in spacesuit and high-G spacecraft seat, ca. 1980. Chinese astronaut in pressure chamber spacesuit test, 1980.